Jonathan and I are perfecting the art of going to sleep early. We eat dinner around 4pm, close all the curtains, and pretend that 7pm is really midnight. Some blame it on him being so old. Others say it’s a side effect of being married. Still others say it’s just because we’re lame. Truth is, when you wake up at 3am to work, you have to go to bed by 7pm to get eight hours of sleep. After three or four days of waking up that early, it’s all you can do to stay awake through dinner on the last night. Day one of work this week had Commander Jonathan and his Vice-Commander J.C. operating the first-ever flight from Hanoi to Phu Quoc. They make a big deal out of this sort of thing here. 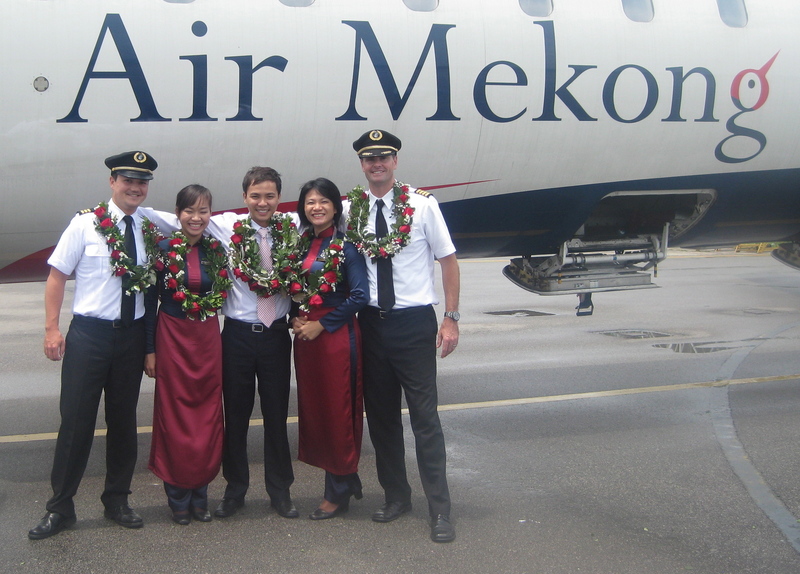 The Air Mekong crewmembers were each given a rose wreath to wear. As always, I’m really proud of him. Yesterday, I spent the morning cleaning our apartment. For those of you who know me, I can be pretty messy in some areas. My closet and drawers are obnoxiously organized, but tables, shelves and dressers – any flat surface – are fair game for junk. I hate the clutter. It makes me crazy. But, it’s hard for me to control. Jonathan is quite the opposite. He’s a minimalist, and, therefore, does not have any clutter. I once told Peter (who shares my struggles with clutter) that marrying a minimalist was like catching a glimpse of mecca far in the distance. There is hope. It works two ways: I know that Jonathan can not deal with the caliber of messes I am capable of producing which makes me more conscious of cleaning up after myself. And, when things do start to get messy, papers pile up on the kitchen table and clutter starts to get out of control, I ask for help. Part of being messy is the inability to figure out where things go, to give things a home. So you have lots of homeless items sitting around giving you guilt for not housing them. It’s miserable. Once we figured that out, things have gotten much better. It also helps that we have significantly less stuff here than we do at home. I know that Jonathan tolerates these two areas because he loves me and is a patient man. I also know that without my charming presence and tasty cooking to distract him for the next three weeks, these two messes could drive him insane (or just highly annoy him.) So, since I love him and want to come home to a sane man, I sorted through my piles of earrings, makeup, bug spray, receipts, medicine, loose buttons, and a frightening array of other random objects to make my vanity unidentifiable (i.e. spotless.) The kitchen table still needs a little work but most of that mess will leave with me tonight. I also cleaned the rest of the apartment, took care of TanJoe’s cat downstairs, and finished a book before noon. There are some benefits to getting up at 3am. Now, I should probably start packing. It’s finally hitting me that I’ll be with family in about 48 hours and I’m getting excited. Moving every year or so helps clear out that stuff. In the process of moving, especially if you have movers, everything must go into boxes. When it all must go into boxes, hopefully not just dumped, it kind of forces the a temporary habit change and kind of reminds me how nice it is to not have the clutter. Also makes me realize that I should have gotten rid of much of the stuff anyway. My guy and I are polar opposites, I believe that’s why we work so well together. My favorite compromise – I clean the inside of the house, he’s responsible for the outside. I hope you have a wonderful time on your trip!